How do you prevent your seemingly experienced and accomplished new-hires from either failing or just not being the right fit for your company? What has to be in place for your company to develop a systematic and proven method to hire high performance salespeople? What steps can you take right now to stop the “revolving door” environment in your sales department? How do you develop proven talent prospecting techniques to build a sales candidate pipeline instead of depending on generic and ineffective internet-based job boards? 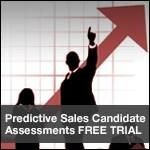 Where can you find a sales specific candidate assessment that is actually predictive of a candidates sales behavior, not just another personality test? By providing Objective Management Group’s award winning S.T.A.R. training program and proven recruiting tools you will gain the skills and resources proven to attract and evaluate the top sales talent in your industry. Statistics show that 75% of replacement hires are as bad as or worse than the salespeople they replaced, however, the utilization of the S.T.A.R program has been proven to transform companies’ results from a 75% failure rate to a documented 93% success rate. The S.T.A.R. program and Objective Management Group’s sales and sales management candidate assessments provide easy, instant access to accurate, insightful results that thousands of successful companies rely upon to choose winning salespeople and sales managers. Science proven, predictive analytics with accuracy so precise that the success rate for recommended applicants is 93%, and the failure rate for applicants not recommended by the evaluation is 75%. Properly vetted salespeople that can actually close business are hired. You attract the most qualified candidates in a competitive talent market. Regain the time you've wasted interviewing candidates that seem viable but are not. Greatly reduced cost of recruiting, on-boarding, and ramp-up.